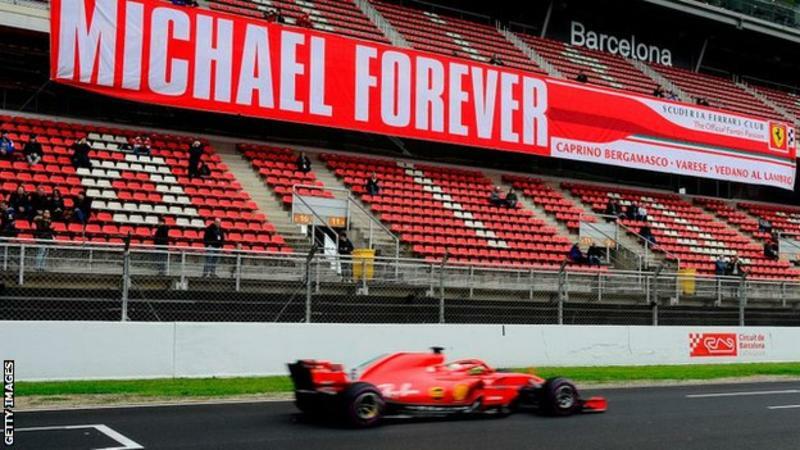 Sebastian Vettel set the fastest lap ever recorded around the Circuit de Catalunya on the penultimate day of pre-season testing. The German was more than a second quicker than anyone else as Ferrari finally showed their hand before the start of the season later this month. Kevin Magnussen's Haas was an eye-opening second fastest ahead of Pierre Gasly's equally surprising Toro Rosso. Lewis Hamilton was only eighth fastest for pre-season favourites Mercedes. The world champion was more than two seconds slower than 2017 title rival Vettel as his team focused on longer runs and heavy fuel loads. "I am pretty happy with the laps I had and the feeling I got for the car. But it is the wrong time to draw any conclusions (about pace)," Vettel said. Pre-season testing times are notoriously unreliable guides to actual form because the specification in which the cars are running is not known. Fuel loads, engine modes and tyre compounds all make a significant difference to performance.